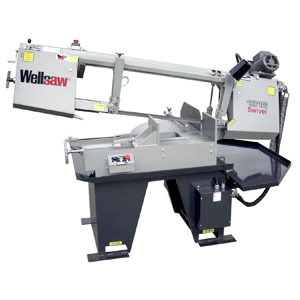 The Wellsaw 1316S is a metal cutting, swivel head, band saw that miters up to 60°. This machine is extremely rugged and built to last. 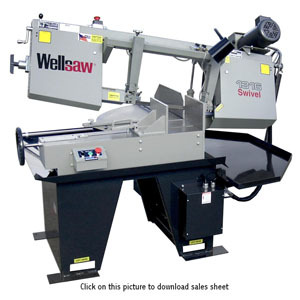 Wellsaw band saws are built entirely in the U.S.A! A high quality metal cutting band saw with features and construction that ensure accurate cutting, ease of operation, and long service life. The Wellsaw brand of saws are built to the highest standards from 100% domestic components to guarantee peak performance for many years. 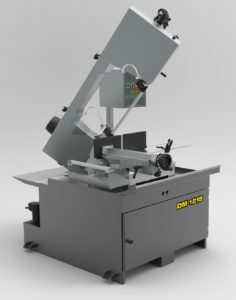 These saws are entirely built with modern cnc technology. All of the band saws are now powder-coated and stay clean, attractive, and won’t allow the saw coolant to eat away the paint like typical band saws. These saws will give you maximum performance, cut straight, and last for ages. By buying this domestic machine vs. the imported saws in this size range, you are guaranteed that parts will be available in the future. A full line of parts is available on all models built since 1933! Please Note: Due to the size and weight of some products, shipping and truck delivery must be arranged by phone or email. 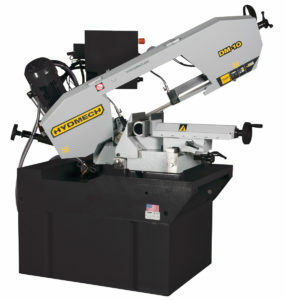 A Detroit Band Saw specialist will call you to make arrangements and give you the final cost including freight charges.